The Buchanan Foundation is a partnership with parents, teachers, alumni and school staff to provide financial support to students and staff. Foundation supported through memberships/donations, Bear Bash and The Brick Program. With the funds raised we have been able to support the following. Our Buchanan Foundation has a Legacy Display Wall outside the main office with engraved bricks. 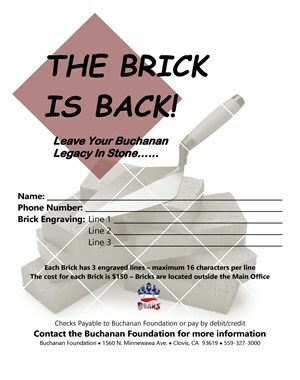 Bricks are available to purchase for the cost of $150.00 each and can have up to three engraved lines. 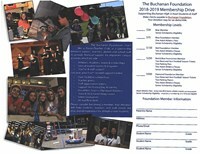 All Funds support Buchanan students with scholarships, staff with classroom needs and much more. Click on flyer to print form.